At Tcon Restoration & Construction we can handle any remodeling project big or small. We are insured, reliable and have a wide variety and range of licensed & specialized professionals to handle every part of your remodeling project. Whether you need a new floor, a new HVAC system, new siding, a new roof, new plumbing or new windows installed, Tcon Restoration & Construction has the knowledge and experience to complete your project. You can depend on us to be your one stop shop for any of your needs – one call to us will get your entire project completed. Do you need help with a start to finish project? Do you need someone to complete a project you can’t finish? Did you need help with designing your basement? Tcon Restoration & Construction does all this and more. Finishing your basement is a great way to give you some additional living space in your home. It also adds value to your home. 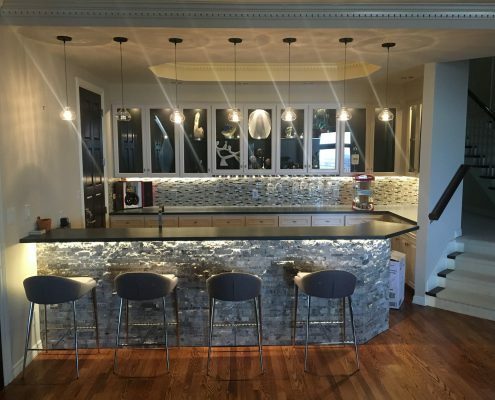 Tcon Restoration & Construction can design your project for you or we can work with your design team to complete your basement remodel project. Is your kitchen old and outdated? Is your kitchen design not exactly what you want? Have you envisioned a kitchen out of a magazine? Tcon Restoration & Construction can design and complete the dream kitchen you always wanted. From installing new counter tops to brand new cabinets, to designing an open space concept; Tcon Restoration & Construction. Contact us to discuss your kitchen remodeling project. What project do you have in mind? Basement finish? Room Addtion? Kitchen Remodel? Bathroom Remodel? Design/Build? Tcon is here to help with any or all of these projects on your list. All of our skilled trades are properly licensed and insured to give you the assurance that it will be done right the first time. If you are looking to start a new remodel project of any kind please call Tcon Restoration & Construction to discuss the details of your specific home improvement project.